According to the 2011 American Community Survey conducted by the Census Bureau, in the United States, 60 million people (1 in 5 Americans) speak a language other than English in their home. Of that 20% of the population, 9% are considered to be Limited English Proficient (LEP). What this means for the healthcare industry is that a mission to care must include the ability to communicate with every patient every time. A failure to be fully dedicated to effectively communicate with patients will ultimately result in low patient satisfaction scores, adverse health outcomes, malpractice claims and financial challenges. Our interpreters are tested for proficiency in active languages and are trained in the art of interpreting. Training is provided on the art of medical interpreting (the role of the interpreter, ethics, basic conversation skills), medical terminology and advanced medical interpreting. Courses also include information on HIPPA, blood-borne pathogens and how to work in a healthcare setting. CulturaLink interpreters receive ongoing education and are held to the National Code of Ethics for Interpreters in Health Care. To deliver on our commitment to provide quick response to our clients’ language services requests, we have a team of language specialists practicing in more than 200 languages. And since you cannot predict when and your patients will need language services, we provide 24/7 service to our partners. We are with you every step of the way, in any language and in any time zone. The process of engaging our language service specialist is quick and easy. We are ready when you are. With some of the fastest connect times in the industry, your patient won’t be left waiting in their time of need. Technology is great, until it doesn’t work for you when you need it most. We’ve all been there and dealt with the frustration. That’s why our system that truly works at the touch of a button, with the technology and features that make it easy to put your language services into action. Translation. Interpreting. It is not as simple as just having any language services provider available in your organization. Effective delivery of language services is not just about language. 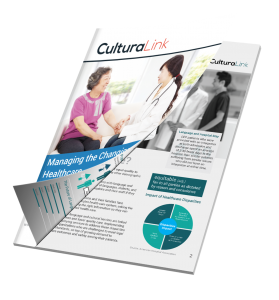 It’s about understanding the culture and values of your diverse patient population. It’s about being a valuable part of your organization, not a nuisance. That’s where CulturaLink makes a difference. We partner industry-best language service specialist with cutting-edge technology and healthcare expertise. The result – a language services solution that adapts and evolves into the daily operations of your organization. DOES YOUR LANGUAGE SERVICES PROVIDER WORK FOR YOU? The interpretation industry has evolved significantly over the last decade or more. This has led to the creation of several language services companies, with varying levels of quality service. Are you working with a partner that is committed to the healthcare industry, and understands the unique demands your patient population can present? How satisfied are you with your current provider? Have you asked your frontline staff what kind of problems they have? Your may assume that all language service providers are alike. However, picking the wrong provider may harm your organization with poor service levels, compliance issues, or unsatisfied patients.